Over 100 years of serving southwest Iowa families have been entrusted to our family - a fact we don't take lightly. Built in the mid-to-late 1800's our former buildings were monuments of heritage of history. In our current facility, we strive to preserve and enhance that legacy. Our service is a symbol of our devotion to create an environment of care and comfort. 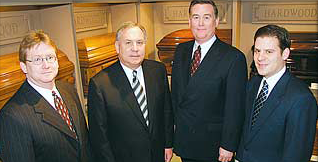 Our licensed funeral directors have over 200 years of combined experience. They are not merely employees of a larger entity; they are the home's owners who see to it personally that the service and attention you desire will be delivered.